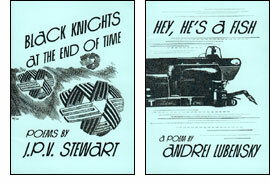 In Black Knights at the End of Time, J.P.V. Stewart gives voice to the immensities and immeasurabilities of our universe in ways that express it as possessing Intelligence at its every scale, from the vastest of forces to the most inconceivably small of subatomic particles. He does so in ways full at once of wonder and of scientific precision, giving an immediate believability to the most extraordinary of scenarios, from the interpenetrations of quantum entities to the endless odyssey of future explorers borne by man-made planetoids. Presented in an upside-down and back-to-back format with Hey, He's A Fish, a long poem by Andrei Lubensky that's fascinating not just because it works powerfully as poetry and as a depiction of a "mechanical" brain developing awareness, but because it so vividly illustrates the artificial arguments at work in trying to divide poetry into narrative and non-narrative: here we have an externally static situation, in which nothing "happens" in terms of the "boatfish" acting or being acted upon, but in which there is a strongly dynamic picture of the developing mental workings of "inner space".